Enter your details here and get an email with demo licenses and download links for Multiplicity sent to your email address. Take a deep breath and then download the demo. Ratios above and below threshold with independent floor and ceiling. Full MS/LR linkage and targetting for sidechain and processing. Global and per-band gain staging. Per-band dry gain for parallel processing. Per-band dual-stage release with configurable RMS detection and crest factor. Configurable oversampling for realtime and render. 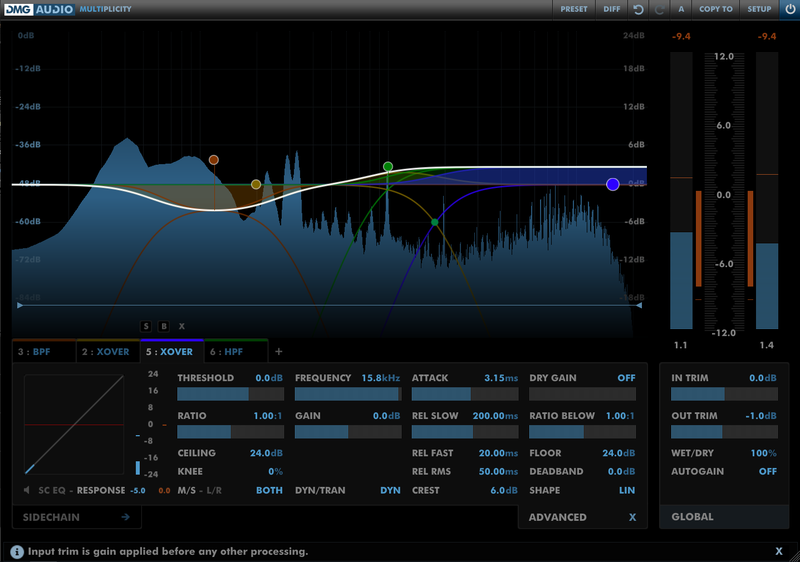 3-band sidechain EQ per band. ITU-1770 based autogain, allowing you to work at a fixed perceptual level. Per-band metering of sidechain PPM and GR. Per-parameter linking, locking and MIDI Learn functionality. Multiplicity runs best with OpenGL2. Most graphics cards work fine. Integrated Intel graphics may perform poorly. I think it's fair to say that it's taken me a long time to find a design for a multiband processor I really believe worthwhile. Multiband designs are necessarily complicated and all too often the remedy is to reduce the degree of control on offer. I think our design manages to avoid this pitfall, so you can get great sounding results without having to compromise. It's always been true that multiband and dynamic EQ are related in terms of how they're used and what they achieve, but it's taken a lot of consideration to achieve a synthesis of the two that works. Our strategy has been to observe and analyse the needs of mastering engineers and to design around that whilst offering further opportunities. Moreover, dynamics processing has been quietly evolving over the last few years and being able to address issues with transients has become especially important for achieving the necessary degree of control. One of the major elements that made our limiter (Limitless) so successful was its ability to differentiate between transients and dynamics and apply different processing to each case. In Multiplicity we've taken things a step further. Without the requirement to limit peaks we are able to achieve a far greater depth of control over the results. I have an ambition that it should be possible to master entirely in software and in doing so achieve better results, by obviating the need to transfer through converters. As such, our design needed to be able to outperform the regular analogue outboard units in both euphony and control. There are often scenarios where the material benefits from a particular character of processing, so we've designed Multiplicity to allow tuning the character to taste. In the heyday of Apple the most exciting announcements were the "one more thing..." moments, where our expectations were suddenly exceeded with news of something new and unexpected. The hope with Multiplicity is to replicate that excitement with a series of "one more thing..." features. It's multiband... and also dynamic EQ. It's a dynamic processor... and also it allows detailed transient control. It's a compressor... and an expander... both above and below the threshold... independently. It has adjustable lookahead... per band! It has adjustable crossover slope... per band! There's no getting around the fact that Multiplicity has a lot of controls but, we've worked hard to keep them manageable. Most of the complexity comes from the new possibilities of what you can achieve with it; things that were previously only ideas or hopes. I feel it's safe to say that there are no other processors that can do what Multiplicity can do for you. We hope you find new and exciting ways of using it to open doors to new and greater things. Our beta team has been very excited about this plugin. We hope it exceeds your expectations too!